Many people wonder how to get rid of huge pores on nose at home? If you’re one of them, then you’re in luck. Today, I’m going to discuss different home treatments—from natural to over-the-counter products—to answer your question. Genetic predisposition (obviously, there’s nothing we can do about that). 1. Use physical and chemical exfoliants. Aside from genetic predisposition, the main reason why you have huge pores on your nose is because of clogged pores due to increased oil (sebum) production. You see, even though your pores are clogged, the oil glands will still continue to produce more oil. This in turn causes your oil glands to expand because the oil can’t get through the clog. As the oil gland gets bigger, so does the pores. What’s even worse is that huge pores are certified dirt magnets. And you know what’s going to happen next if you don’t solve the problem fast—acne breakout! 1.) Pour a small amount of mild granular cleanser, and then gently massage into the areas with large pores for fifteen seconds maximum. Rinse then pat dry. 2.) Next, apply a small amount of mild chemical exfoliant with 10% to 15% glycolic acid or 2% salicylic acid. Based on clinical trial, glycolic acid helps shrink pores with minimal side effects. The important thing is to do this treatment repetitively to cause noticeable improvement. Should you use a glycolic acid or salicylic acid exfoliant? A rule of thumb is to use glycolic acid to exfoliate if you have a dry skin or sun-damaged skin because of its hydrating effects. A salicylic acid exfoliant is better for people with oily, sensitive, or acne-prone skin. The great thing about salicylic acid is it’s able to penetrate oil clogged pores easily. 2. Protect your skin from sun damage. Prolonged exposure to ultraviolet light could damage your skin’s collagen. This then leads to sagging of your pores, thus making them enlarged and visible. Common advice is to wear sunscreen. However, sunscreens don’t give you one-hundred percent protection. Maryland Dermatologist Paula Bourelly said that sunscreen products, especially those that offer the best protection against UV rays, often break down the fastest when they come in contact with the sunlight. Plus, they only protect you from ultraviolet-B rays, not ultraviolet-A rays, which deeply penetrate the skin and destroy collagen and other cellular structures. Vitamins C and E are two of the most popular antioxidants that have been the subject of many clinical studies when it comes to their photoprotective effects. As antioxidants, they’re responsible for neutralizing the skin-damaging effects of excess free radicals, which are produced by your body when exposed to ultraviolet rays. Vitamin C is believed to be the only antioxidant that can stimulate collagen growth. There are a growing number of research studies that suggest topical antioxidants may help protect the skin from sun damage. In one study published in the Journal of the American Academy of Dermatology, researchers enrolled nine white adults to study the effects of a specially formulated cream containing0.5% ferulic acid, 1% vitamin E, and 15% vitamin C.
After application of this formulated cream, the subjects were exposed to simulated sun irradiation. Results showed that this cream—thanks to its ferulic acid content—was able to decrease redness and sunburned skin cells. It even almost completely stopped the formation of tumors and UV-linked genetic damage (thymine dimers). Green tea is a great natural sunscreen, at least that’s what studies show. That’s thanks to its four major polyphenols epicatechin, epicatechin-3-gallate (ECG), epigallocatechin-3-gallate (EGCG), and epigallocatechin (EGC), which are able to protect the skin from premature aging caused by ultraviolet radiation. One way to use it as a topical sunscreen is to dab a small amount of its infusion on the skin at least half an hour before you go out of the house. Or, you could drink it. Researchers of one clinical trial gave 540 mg (or around two cups) of green tea extract plus 50 mg vitamin C to their test subjects daily. After three months, results have shown that skin redness (erythema) was reduced after exposure to ultraviolet light. It was also able to protect the skin from sunburn-related inflammation and long-term ultraviolet radiation damage. These are just two of the many ways you can protect the skin, especially on the nose, from enlarged pores, age spots, wrinkles, and other skin imperfections. 3. Pay attention to the foods you eat. I’m sure you’ve heard dermatologists and skin care gurus say that diet has nothing to do with common skin issues, such as acne. The truth is there are a growing number of researches that debunk this popular belief. It’s even said that acne is a disease of the Western society. But before you violently react, there’s actually a study conducted by Dr. Loren Cordain and colleagues that proves it. They focused their study on two non-westernized societies: the Papua New Guinea Kitavan Islanders and the Paraguay Aché hunter-gatherers, which have zero acne prevalence. The Western diet usually includes foods rich in saturated and trans-fatty acids. 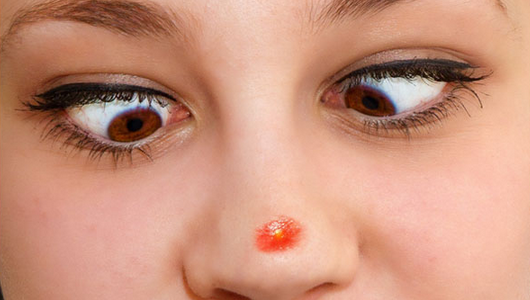 What does nutrition has to do with those huge pores on your nose? Nutrition doesn’t really affect the size of your pores. But, it does play a crucial role in the amount of sebum your glands produce, which can directly influence the size of your pores. Interestingly, your dietary intake pattern can also influence your skin type. A study published in the Korean Journal of Community Nutrition enrolled 58 subjects. They were categorized into four skin type groups: the dry skin group (19 students), the combination skin group (11 students), the acne group (17 students), and the oily skin group (11 students). What did the researchers discovered? They found out that the oily skin group has a higher dietary intake of fatty and energy-giving foods compared to the dry skin group. The blood cholesterol level of the oily skin group was higher than that of the combination skin group. And the combination skin group had a higher intake of vitamin C than the dry skin group. These studies are just a few proofs that the foods you eat will show on your skin. That’s why it’s important that you try to fill your plate with foods that promote healthy skin. Foods containing high amounts of fats could trigger the production of hormones, like androgens, which could increase oil excretion that could lead to acne formation and clogged pores. Simply put, a glycemic index tells you how fast a certain food will raise your blood sugar levels. You don’t want to consume foods that have high glycemic index in this particular case because they’ll aggravate acne and promote inflammation. Corn, avocado, blueberries, apples (with skin), grapefruits, beans, and whole wheat pasta are just a few examples of high fiber foods that you can add to your daily diet. They’re good for fighting against huge pores on the nose. They help keep your body’s digestive process in better shape. This in turn prevents toxin buildup, which will ultimately show on your skin. These nutrients will promote skin regeneration and control the functions of your oil glands. Some of these foods you could consider are spinach, carrots, tofu, beef liver, mackerel, red meat (beef), soybeans, mangoes, and tomatoes. 4. Apply astringent herbs for enlarged pores on the nose. Astringents are recommended for people with oily skin. Basically, it works by constricting body tissues and draw them together. This causes your skin to tighten and the pores to get smaller. The only downside is that it can be drying, if used in excessive amounts. Combine ½ tablespoon of lemon juice with 1 tablespoon of raw honey. Apply the mixture on your nose, and then let it sit for 10 to 15 minutes. Rinse with cool water to shrink the pores even more. Don’t forget to moisturize after. Store the excess mixture in the fridge for later use. Warning: Lemon juice can be strong, so don’t forget to dilute it and do a skin patch test first. Mash or grate 2 slices of fresh cucumber. Soak the mashed cucumber in 2 ounces of rose water. Place in the fridge for 45 minutes. After, apply it on your nose then let it sit for 15 to 20 minutes. If there’s any leftover, you can store it in the fridge, but it’s only good to use for 2 to 4 days. I suggest you use fresh tomato juice, not the canned type. To whip up your own tomato juice astringent, mash 2 slices of tomato, and then strain it. Mix with 1 ½ tablespoons of plain yogurt. Spread the mixture on your nose, including the skin near it. Leave it for 15 minutes before rinsing with room temperature water. You can buy green tea pore strips online, but if you prefer to make your own, then here’s a recipe you can follow: Combine 2 tablespoons of green tea, ½ tablespoon runny honey, and 1 tablespoon of plain yogurt. Mix well, and then apply to your nose. Leave it for 10 to 15 minutes. Rinse with cool water. Bad news: Despite popular belief, there are no natural or over-the-counter products that could totally shrink or close your pores. Good news: There are remedies that could make your nose pores appear smaller, clearer, and smoother. And one of the best ways you could do to solve the problem is to follow a skin care regimen that’ll effectively remove excess oil and dirt and unclog the pores.